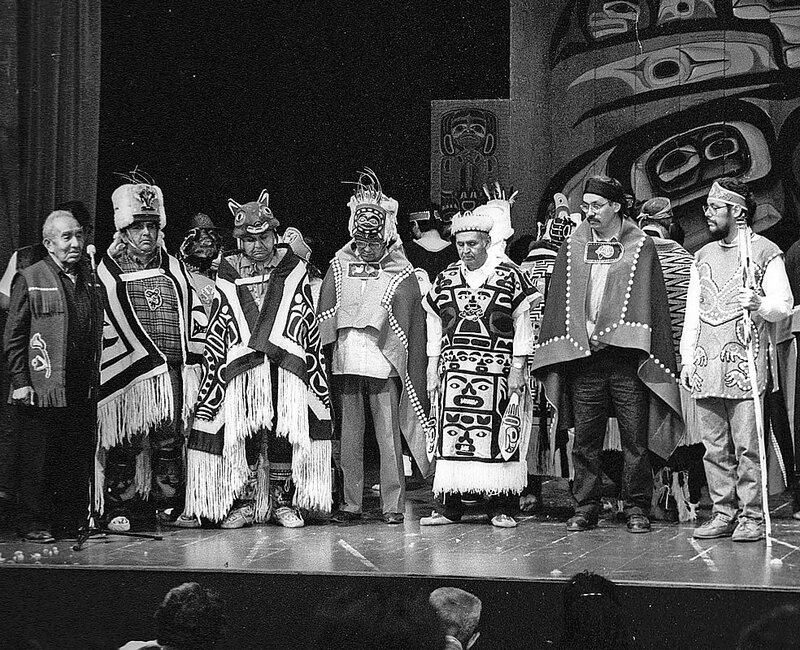 At the 1993 conference: Andy Hope III, in button blanket second from right, stands with his brother Gerry (in tunic holding the stave). The “Sharing Our Knowledge” conference concept was pioneered by the late Andy Hope III. The first conference was held in May 1993 in Haines/Klukwan, followed in the next few years by conferences in Ketchikan/Saxman and Sitka. Ten years lapsed until the most recent conferences, held in 2007 (Sitka), 2009 (Juneau), 2012 (Sitka), 2013 and 2015 (Juneau), each of which attracted over 400 participants and nearly 100 presenters. The most recent conference was held in Sitka, October 13-17, 2017, at the Sitka Fine Arts Camp (formerly Sheldon Jackson School) campus. For more information see links on the panel at left.